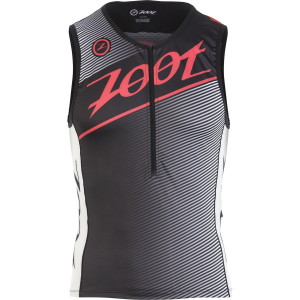 Adeptly crushing all three stages of a triathlon, the Zoot Men's Tri Team Tank Top provides a streamlined fit and moisture-wicking comfort for athletes pushing their limits on race day. Sublimated Italian fabric is extremely lightweight and quick-drying, preventing you from soaking in moisture after the swim stage. This fabric is also well-suited for riding and running by pulling sweat off your body where it can readily evaporate. SeamLink construction eliminates irritation by naturally stretching with your every move. Three rear pockets conveniently hold energy gels and other necessities within easy reach. Other race-friendly features include a 10-inch CamLock zipper for extra ventilation, as well as UPF 50+ for protection from scorching UV radiation.